John McTiernan's 1988 action film Die Hard was a game-changer in Hollywood action cinema, pitting a single ordinary protagonist against a group of armed villains. Police lieutenant John McClane (Bruce Willis) was a working-class everyman who panicked, got injured and generally survived the movie and saved the day by the skin of his teeth. The film was such a hit that 20th Century Fox repeated the formula in 1990's Die Hard 2: Die Harder, and then repurposed an unrelated screenplay to make 1995's Die Hard with a Vengeance. After a lengthy break the series got a fourth instalment in 2007 with the amiable but ridiculously over-the-top Live Free or Die Hard, and that film's success led to a fifth film six years later. In A Good Day to Die Hard, the increasingly old and cranky Lieutenant McClane travels to Russia when his wayward son Jack is arrested for murder. Once there he discovers his son is a top-level CIA agent neck-deep in rescuing a disgraced dissident from an aspiring defence minister in the making. Or something. To be honest I'm fuzzy on the details because this is the worst film from 2013 that I have seen. Now I'm sure there were worse movies last year. There are always worse movies. This, however, is a bad movie that hurts, because it's part of a franchise that includes at least three enjoyable films and one all-time motion picture classic. It shames them. 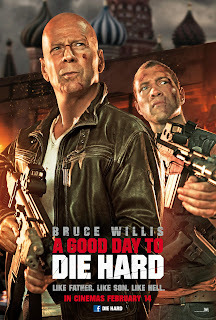 It drags John McClane back into action, a little too tired and a little too old, to transform him into the archetypal ugly American on holiday in the Russian Federation. There he immediately starts engaging in high-speed car chases, not because he has good reason to but because the film requires him to. It takes this film an absolute age to explain what the hell is actually going on, and by the time the explanation is forthcoming it's too late: I simply didn't care any more. There are some action scenes. Some things explode. Bruce Willis says "Yippee kye ay" before killing somebody. It used to be that McClane was in the wrong place at the wrong time. Now it seems he's in the wrong movie. He is essentially a mouthy sidekick in his son's film, with 20th Century Fox abandoning all subtlety in their quest to give the franchise a younger, cheaper lead (Jai Courtney) and continue into a sixth instalment and beyond. Courtney's not a bad actor - he made a great villain in Jack Reacher - but here he's got nothing to work with except for a cliched resentment of his own father. Given McClane Sr's antics in this movie, I don't blame him. This film earned Fox $300 million dollars, raising the horrible possibility that in another few years we could be back here again, flogging a dead horse for all that it's worth. Commercially, it still seems that Die Hard is worth plenty. Creatively, it's bankrupt.